Teething is tough on everyone. When those first little nubbins start to appear, sore gums and a cranky disposition come with the territory. These answers to common teething questions will help you determine whether teeth are on the horizon, and how to soothe your baby during this uncomfortable time. When can I expect my baby to sprout his first tooth? Between four and seven months of age, you’ll probably notice two little red swellings at the front of your baby’s bottom gums—a sign that he’s “cutting” his first teeth. Baby teeth usually come in pairs: the bottom front two teeth typically show up first, followed by the top ones. By age three, your child should have all 20 primary teeth, which start to fall out around kindergarten. 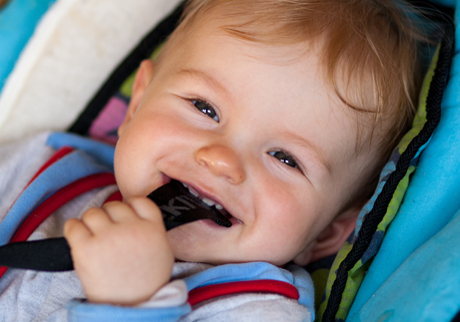 If your child shows no signs of teething by 12 months, check with your doctor or dentist. Keep in mind that teething patterns tend to be hereditary, so if you were late teething, your baby might still be flashing that gummy smile as late as 18 months. My baby is chewing on everything in sight. Does that mean she’s teething? Teeth marks on baby’s crib are definitely one of the signs more teeth are on the way. Your normally cheerful tyke may also have occasional crankiness and crying (tender, swollen gums can cause pain and irritability), although some children will sail through teething with nary a whimper. Other symptoms may include increased drooling, and disrupted sleeping. How can I make teething easier on my child? One of the best ways to ease teething pain is to massage your baby’s gums firmly and gently with a clean finger for a minute or two, says Lang. You can also offer a cold washcloth or teething ring (chill in the fridge, not freezer), as they have a numbing effect. Once teeth erupt, avoid liquid-filled teething rings, especially ones with little objects floating inside, as baby’s new teeth may puncture them. Also, avoid teething rings with rough edges that can scrape an infant’s soft gums. Some parents swear by the pain-relieving effects of teething gels, such as Orajel. However, they contain benzocaine, an anaesthetic that numbs the gums and could interfere with your baby’s swallowing. They also carry a small risk of allergic reactions. If your child is miserable and you choose to use a topical gel, don’t apply it more than four times a day. Check the packaging for instructions and speak to your pharmacist for guidance. Why is my baby drooling so much? All that saliva actually helps cool inflamed and tender gums and speeds up the healing process. To help prevent dry, chapped skin and rashes on cheeks and chins, keep them dry (pat with a soft cloth or tissue, but don’t rub) and apply a simple barrier cream, such as fragrance-free Zincofax or petroleum jelly.